How to Arrange Patio Furniture for a Stunning Outdoor Space! Many feel that their home is not complete without and outdoor area for living, dining, reading, and conversation. 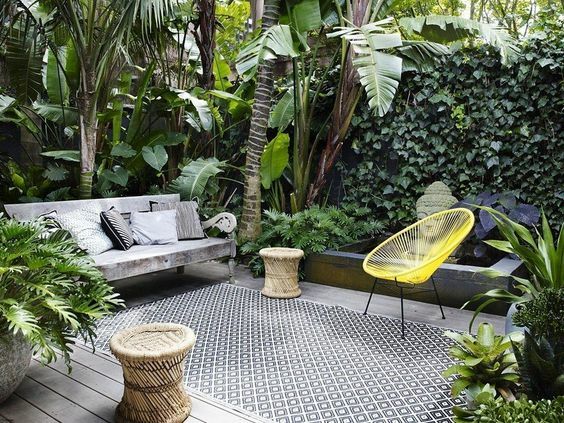 But often these outdoor spaces are neglected in favor of focus on the kitchen, bedroom suite, living room, etc. This article is a guide on how to arrange patio furniture to turn your patio space into a beautiful, dynamic outdoor room. We look at patio furniture configurations as well as general patio design ideas in order to make your patio sing! 2.1 How Can I Plan My Layout Better? 2.2 Is There a Certain Type of Patio Furniture One Should Use? When buyers shop for patio furniture it can be a little exciting, envisioning how the new pieces will look in the outdoor environment. However, this can end up leading to one buying mix and match pieces of furniture that don’t go well with each other and won’t look good in an arrangement. Because of this, one should first think things out. One should consider the layout, color scheme, theme, and design to incorporate so pieces can be picked out that best match it. This will end up helping the patio furniture to look well designed rather than as a bunch of pieces put randomly together. Sectional sets can really shine when it comes to flexible arrangements. A large sectional set can function as a conversation set, multiple seating areas, a daybed, a large sofa, loveseat, and seating, etc. Many who are setting up their patios will want to start with a sectional set, as you’ll get the most flexibility with one of these designs. The Modenzi 7-piece set shown above is an outstanding choice, and their diagrams for layout ideas is quite helpful. Patios come in many different designs. They can be circular, square, oblong, or angled, for instance. This shape can be used in your patio arrangement when choosing furniture. If you have an odd shape for your patio, it may be best to embrace the character of the odd shape and make it feel complex and multi-faceted. If instead, you have a simple rectangular patio, you may want to introduce some circular or other oddly-shapen dynamics into the environment. One tip to use when it comes to arranging patio furniture is to keep an eye out for a highlight near the patio. This could be anything from a towering patio tree to a beautiful fire pit to a rapidly cooking pizza oven. 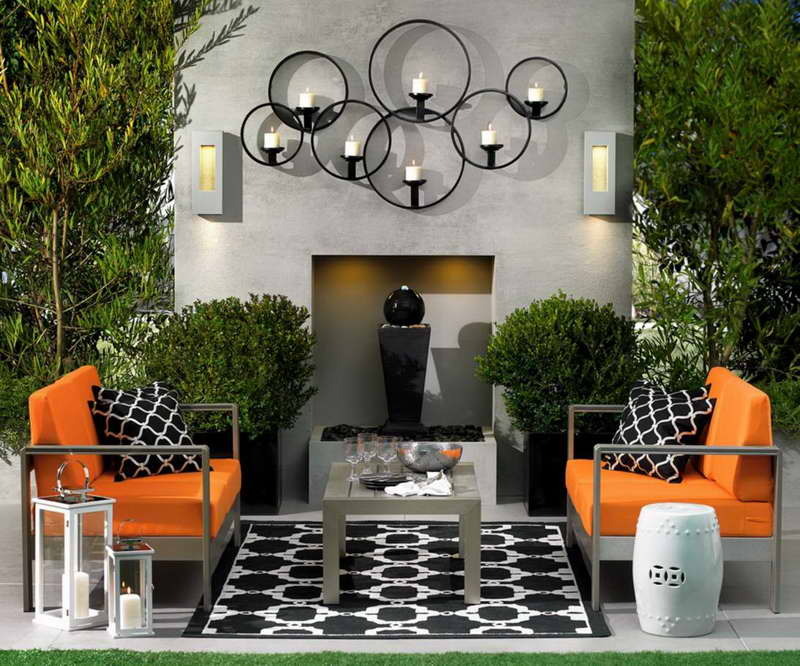 Regardless of what that focal point is, try to put combine your focal point with carefully-chosen furniture on the patio that will correspond well with that highlight. You don’t want the furniture to overwhelm the focal point, but rather to connect with it and amplify it. If one has a particular area inside the patio that one wants people’s eyes to instantly catch, work the furniture arrangement around that focal point. It might also be a good idea to face all patio furniture toward that highlight, like a pool or vast field, to give guests on the patio a more interesting ambiance. Patios tend to be connected to a house or other similar structure, and will usually be bordered by some type of a wall. Use this wall to your advantage. This long wall can be a great spot for longer pieces of patio furniture like sectional sofas or outdoor daybeds. This spot is often at least partly shaded due to the presence of the house, and can be a nice place for longer pieces, assuming there isn’t a door interrupting the flow through the wall. If you haven’t yet built your patio yet, you may want to consider keeping the door to the patio space on one side of the patio to enable good circulation around the area. The next thing you should consider when it comes to arranging patio furniture is choosing whether they want to incorporate asymmetrical or symmetrical furniture designs. Asymmetrical arrangements will be a little more scattered. While not random, they aren’t as clean-cut as symmetrical designs are. If one is looking for more of a free-flowing patio arrangement, an asymmetrical arrangement might be best. The above image has an asymmetrical patio with an interesting set of side tables providing a foundation, and a beautiful yellow Acapulco chair balancing out a unique heavy gray sofa. Symmetrical arrangements, on the other hand, are more traditional. If one chair is placed on the side of a fire pit, the other side will have one as well. This type is ideal for those who want evenness in their patio arrangement. It’s important to keep this step in mind because it’s one of the most vital aspects of arranging patio furniture. In the above photo, the symmetry is practically the theme of the space, and it is all perfectly balanced. We love the inset water fountain and the ceramic garden stool. And the votive candle holder is perfect! Look at your patio and garden as a whole, and find one or more small “nooks” for quiet conversation, sheltered reading, and the like. These should be away from the primary seating area, whether that be an outdoor living room set or a dining table set. A bistro set, glider bench, or even outdoor bean bag chairs can all be great options for napping, reading, and quiet conversation. 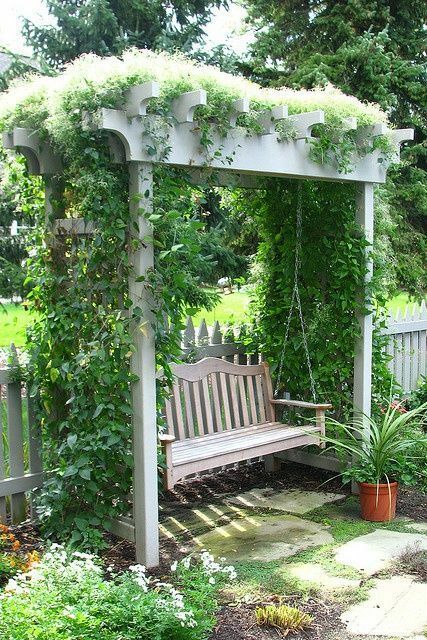 The above photo shows a patio swing bench attached to a small wooden arbor. Lovely. Shaded areas on the patio should be considered when arranging patio furniture, especially during the hot months of the year. For instance, while the warm sun in the summer might be nice in the morning, it can be blazing in the afternoon which can be uncomfortable for those sitting on the patio then. Depending on the orientation and features of your patio, you will likely have one or more naturally-shaded areas that can be ideal for seating areas. 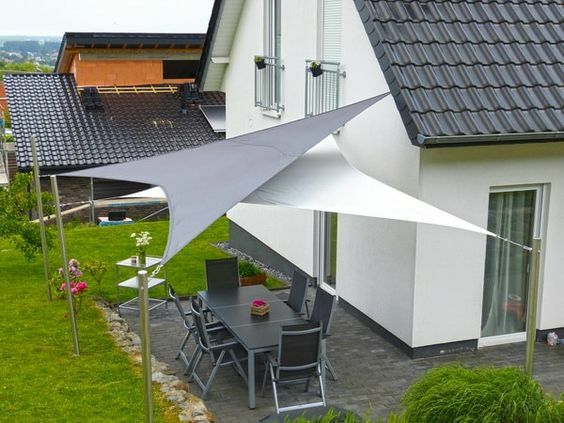 Additionally, an artificial shade like a cantilever umbrella, shade sail, or an awning can be a great asset in creating dynamic spaces. How Can I Plan My Layout Better? There are plenty of ways one can help to better visualize their patio arrangement better. One can just draw it out on some paper or use one of the many layout tools available on the Internet such as FloorPlanner and Sketchup. This can help one to better work out their patio arrangement to make sure it fits their needs perfectly. Is There a Certain Type of Patio Furniture One Should Use? There isn’t necessarily a specific type of patio furniture one should use, but it’s a good idea to make sure the furniture used on it is specifically for outdoor purposes. See here for information on which brands of patio furniture are best. 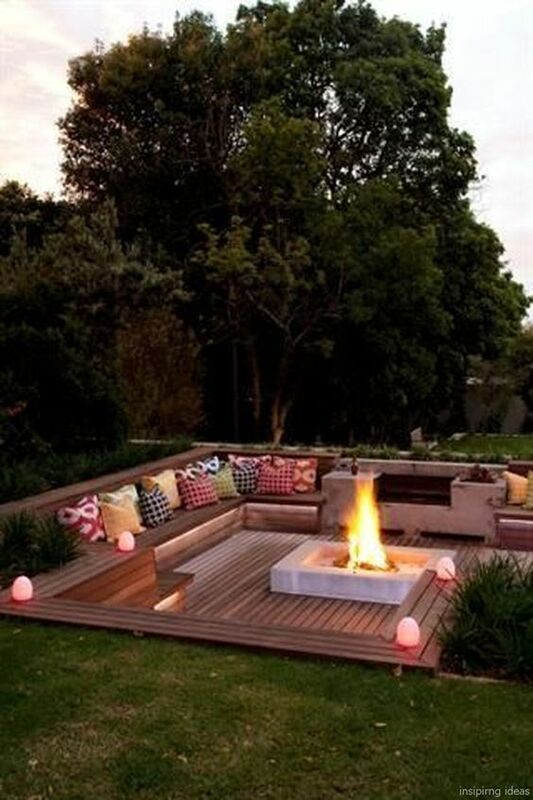 Some people like to incorporate indoor furniture pieces outdoors. While these pieces might look nice, the vast majority of these items aren’t designed to withstand the weather and elements. Unless your space is incredibly well protected from the elements (e.g. a screened porch with a solid roof in a place where there is very little rain), you should not try to use your indoor furniture outside. Of course, it’s fine to bring pieces outside for an afternoon that you know will not be rainy or whatever, but it is almost always unwise to leave your indoor furniture outside for any length of time. Arranging patio furniture can be a little bit of challenge, but with these tips, it doesn’t have to be so. By just keeping things in mind like picking out a focal point near your patio or just considering the seasons of the year, one can be sure that their arrangement will look spectacular. 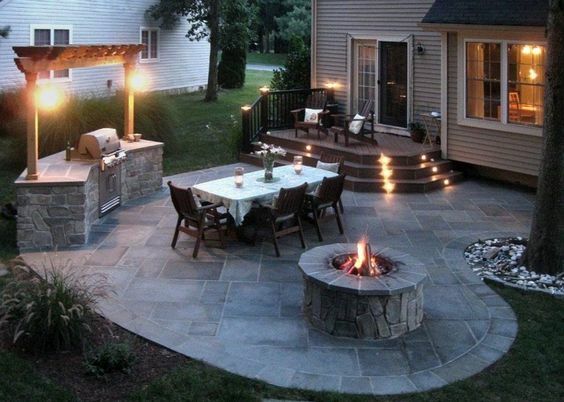 Good luck designing and transforming your patio into a magical space!